After a strangely stilted, disjointed performance, the USWNT has been kicked out of a major international tournament before the semifinal stage for the first time ever. Sweden were good, the U.S. were pretty bad, and the refereeing was worse. The Americans had decent control of the match for most of the duration, but couldn’t make anything happen in the final third. Overhit passes, deep crosses from stranded wingers that never found their target, and settling for low-percentage shots from outside the box plagued the USWNT’s attack all afternoon. Sweden didn’t look terribly threatening with any regularity, but when they did attack, they did so against limited numbers on promising counters. Sweden scored the game’s opener from one such counter in the 61st minute, but the U.S. tied the match back up when a defensive mistake deep in their own territory gifted Alex Morgan the ball in the box, where she easily scored. The Americans came close to killing the game off with a second goal in the latter stages of the second half, but couldn’t find the breakthrough. After 90 minutes of regulation, the game went to extra time. The referee almost ruined the game from there, with two quick calls that disallowed goals. On the first, the ref appeared to signal an incorrect offside call on Carli Lloyd right before she kicked in the would-be go-ahead goal. However, there’s a good chance that the line judge actually flagged Lloyd for a (justified) foul on the play. Almost immediately after that play, Lotta Schelin put the ball in the back of Hope Solo’s net only for that obviously good goal to be waved offside. In the penalty shootout, Morgan stepped up to take the first one and saw her weak shot saved easily. Solo managed to save a Swedish effort a couple kicks later, but Christen Press—who came on in the 100th minute and looked badly off rhythm for her entire time on the pitch—skied what was the penultimate penalty. 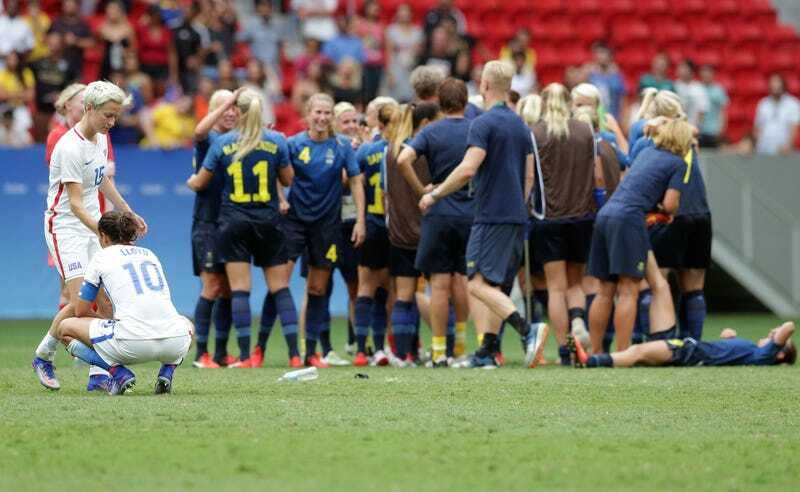 Sweden scored their next one and now progress on to the semifinal, giving the USWNT their earliest ever exit from an Olympics or World Cup—and orchestrated by former USWNT manager Pia Sundhage, now coaching her native Sweden, no less. So ends the national team’s quest to be the first team to win the World Cup and Olympic gold in successive tournaments.